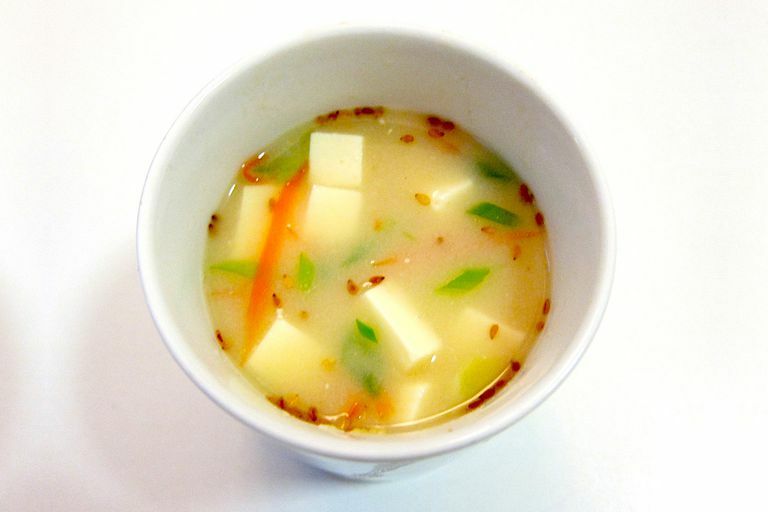 Step out of your breakfast rut and try a steaming bowl of miso soup to kick off your morning meal. A typical American breakfast tends to be high in added sugar and/or saturated fat. This soup, on the other hand, is lean, light, and full of good-for-you ingredients. Miso paste is made from fermented beans and sometimes grains, and like yogurt, it is full of live, active cultures. Keep a small tub of miso paste in your refrigerator; it keeps fresh for a long time and is a great addition to salad dressings, soups, and even popcorn. A soothing miso based "broth" makes a quick and easy base for almost any vegetable and protein. This single serving recipe uses chopped scallions, shredded carrots, and a handful of chopped soft tofu for body and protein. Bring the water, scallions, and carrot to a boil. Reduce heat to a simmer. Place the miso paste in a small bowl and ladle a quarter to half a cup water into the bowl. Stir quickly with a fork or whisk until no clumps remain. Pour the mini bowl of miso and water into the pot of water. Add the tofu and sesame seeds and stir. Pour into a bowl or mug and serve. Do you love miso soup? Turn it into a more robust meal by adding in some cooked soba or whole wheat noodles or a scoop of cooked brown rice. Stir in steamed broccoli or bok choy, and you can even add a ramen-style boiled egg for additional protein. A lot of cultures around the world eat savory breakfasts. Branch out and try eating leftovers from last night's dinner for breakfast, or include more beans, tofu, or even chicken and fish at the breakfast meal. You may feel more satisfied with a more robust morning meal. Plus, it is a great way to cut down on added sugars and maybe even get an additional serving of veggies!